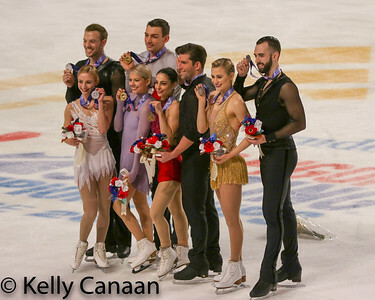 Photos from the ladies', pairs', and men's free skates in San Jose. PLEASE DO NOT REPRODUCE WITHOUT PERMISSION. Husband and wife Alexa Scimeca-Knierim and Chris Knierim show their elegant side in their free skate. They won gold and were chosen as the lone US-representatives in pairs to go to the Olympics. Ashley Cain and Timothy LeDuc had fun throughout their free skate in San Jose; they finished 4th. I must admit, I love this photo of Haven Denney and Brandon Frazier as he throws her for a split triple-twist. They finished 5th.